Looking to a buy a home in the Pocono Mountains? The Pocono Mountains offers its Home Owners, Second Home Buyers, and Vacation Renters A lot of options. The most popular Home Setting of Choice is the Lakefront Home. Lakefront housing in the Poconos has steadily been the most popular purchase of any home in the Pocono Mountains! Bodies of Water flow throughout the entire Mountain Region. The Lehigh River flows through Amenity Filled Communities such as Bear Creek Lake and Riverside Estates, The Delaware River flows through The Stroudsburg and Deleware Water Gap area, and there are so many Lakes, Streams, Creeks, and even waterfalls in some areas! Everywhere you look in the Poconos, you are bound to see a lovely lake of some sort. 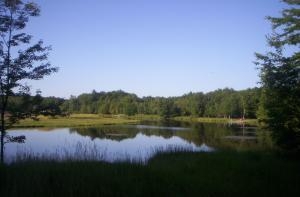 Lakefront Housing in the Poconos gives you the chance to have a lake right in your backyard! Another Pocono Mountain Home is my personal favorite, and it is one of the more traditional styles of Pocono Homes that there are. Certainly, one of the most sought after properties for Pocono Mountain living is the Pocono Log Home. Nothing says cozy and warm like a Log Home in the Pocono Mountains. Most Log Homes come with very nice stone faced fireplaces, propane fireplaces, or any kind of fireplace. The Pocono Log Home fits right into the category of "Living the Pocono Dream." There is just a very rustic, woodsy, private, and cozy look to the log homes in the Poconos. The smell and feel of the classic log home leaves you wanting to be closer to nature. The thoughts of sitting by a roaring fireplace while the snow gently falls onto the large pine trees is just Pocono Magic. These are just two styles of Pocono Mountain Homes For Sale all across the region. The uniquness and variety of Homes, Communities, and Fun Things to do in the Poconos are endless!